We lost our wonderful husband/father/grandfather on Saturday morning at Saanich Peninsula Hospital with all his family close by. Left to mourn are his wife of 68 years, Margot, daughters Kathy (Scott) and Margaret (Simon), sons Stephen (Barbara) and Bruce (Susan), grandchildren Kristina, Jennifer, Melissa, Lindsay, Allison and Michael and seven great-grandchildren. George loved to tell about his years at Pitt Lake where his father, a Master Mariner, had bought a hunting and Fishing Lodge. At the age of 8 he was taken out of school for 3 years and had only animals to play with. He learned, then, how to like being alone. When the war started his father wasted no time applying for the service and was quickly given command of a supply ship. George and his mother moved to Vancouver where he had 3 years of schooling to catch up. Then to Victoria to Monterey School and Oak Bay High where he met Margot. Discouraging advice from a guidance counsellor was all it took to send George into Electrical Engineering at UBC where he graduated with 2nd class honors. Picked up for the General Electric Test Course in Peterborough, George and Margot set off for their great adventure in the East. After 4 years in Peterborough he was sent to Vancouver to work as a power systems engineer. Next on to Niagara Falls as a project engineer where he became head of the electrical dept. at H.G. Acres and Co. and very involved with the development of Churchill Falls power electric project in Newfoundland. It was during this work with frequent trips to Montreal that he narrowly missed the fatal flight of the plane that crashed outside Ste. Therese. 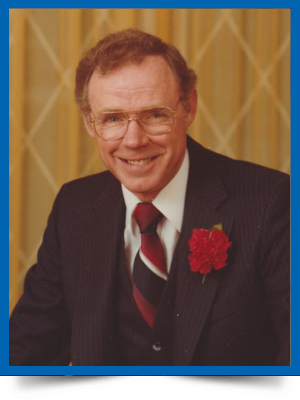 He and then family moved to Toronto in 1967 where he became Vice President and Director of Acres International. After 3 years of travel in South America, where he was appointed the representative for the new Brazil Airport project, he became interested in the Salto Grande Hydro project in Argentina. Soon the family moved to Argentina. After two years, the project was assured and announced in the papers and celebrations were in order. Suddenly, in true Argentine fashion, the project was taken over by an American firm. The American Military had a strong presence in Argentina. Time to come home to Canada where he began his own business, G. Clayton Assoc. Ltd. Consulting Firm and then become a member of the Ontario Energy Board. He and Margot then moved back to BC where among other interests he became “Mr. Pipeline” managing the early stages of the Kitimat Pipeline. He then worked for Westcoast Energy until his retirement at age 72. We will miss his sense of humor, his love for the family and his preoccupation with boats. In lieu of flowers, please make donation to either the BC Cancer Society or the Heart and Stroke Foundation. A Celebration of Life will be held at the Garden Chapel of Royal Oak Burial Park on Wednesday, November 28 at 11:00 a.m. So very sorry about George. Our thoughts are with you and your family at this time. I was saddened to hear about the loss of your Dad. What an interesting man he was…cherish the good times and keep your memories close to your heart. Thinking of you and Barb and the kids at this difficult time. I wish to extend my heart felt condolence to you and family over your great loss. I have fond memories of visits to your home and boat with warm greetings offered by George and you. This is how I will always remember George. He will not be forgotten. Sincerely, Spencer Davies.